I recently met a wonderful artist by the name of Jerry, who shared with me how he’s customized his Pocket Palette. Jerry wanted to carry more colors in a single palette, and came up with a creative solution. He divided the standard palette pans with brass rods, soldering them in place and grinding them smooth. To finish, he painted the interiors with white enamel and the exteriors with a durable black paint. According to Jerry, this process was labor intensive, but the pans should last a long time! Lucky for me, he sent me a set to experiment with–now I just need to decide on all the extra colors I can bring! Wow–what a creative way to do this! Amazing, Jerry! I have two palettes–each with different colors. I love this! But for a less labor-intensive method, I wonder if one could create temporary dividers with a carefully placed strip of hot glue in each pan? I can’t speak to hot gluing in one of Maria’s lovely kits, but I’m using emptied dollar store eyeshadow palettes and the hot glue as a divider seems to be working so far. This is mostly on plastic, though I’ve used one to divide an aluminum pan and it seems to be behaving. My kiddo’s Daler Rowney pocket box has taken similar treatment in the back ledge to let her add a few sections from tube colors. I have a Winsor and Newton Cotman Sketchers box. It has a small spot above the pans to hold a tiny travel brush. Instead I put lines of hot glue to divide it into areas for paint. It works great for me! I imagine that it would work out great for the awesome pocket palette too. Nicely done, thank you for sharing your palette, Crystal! Where/how can I buy a Pocket Palette? Hi Kathleen! 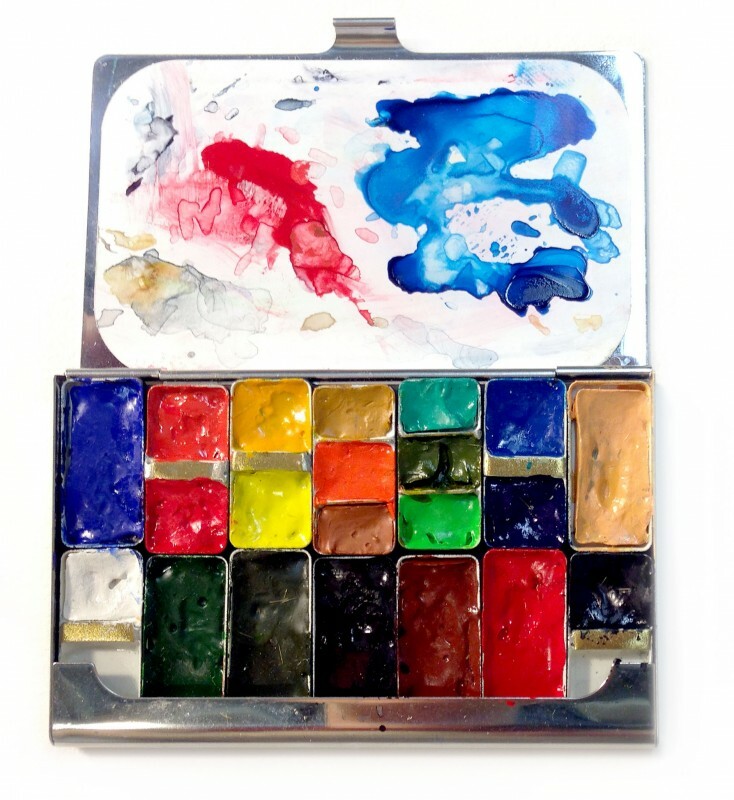 The Pocket Palette and my other Art Toolkit supplies are all available in my Shop. Thank you! Would you be able to sell Jerry’s divided color pans as an accessory? Or does he sell them? Hi Bonnie, the divided pans are labor intensive with the soldered metal and unfortunately are not for sale. One idea for making your own, though, would be to try Sugru! It’s available at most hardware stores. I used Sugru and it worked. But it did use a lot of space in the pan — it was hard to get it to be narrow and yet tall enough.